Digital Town Hall: Co-Creating a Smart London took place on Tuesday, 13 June 2017, in the historic Town Hall of Bethnal Green that has become a hotel and event venue. The meeting was organised by Robert Monster, CEO of Digital Town who calls himself an ‘enlightened capitalist’ and introduced IoP as the Internet of … PEOPLE! To my delight, I also saw a slide on Public Private PEOPLE Partnerships! We are one species and we meet each other. It’s about re-connecting the people who were split. A Smart Cities Network is Globalisation 2.0 – beyond corporations and politics, based on fairness, enlightened self-interest and life on earth not as a sprint, but a team sport. In the age of advanced globalisation, everybody in position of authority has a dual mandate: 1. their own people and 2. everybody else on the planet. I perceive a new standard of governance. All good things come from stirring things up, bringing the conventional and the sharing economy together. We need minds with telescopes rather than minds with microscopes! This was followed by MARK SCHWARTZ from New York who talked about ‘identity’ as if it mainly related to ‘numbers’ representing us like our National Insurance number. Instead, identity on the web needs to be ‘local’ and ‘portable’. Cities who want to stand out need to embrace these new mindsets! STEPHEN LORIMER was the Mayor’s representative and is responsible for Smart City Policy. He told me that my borough Camden and Greenwich are the leading smart boroughs, whereas ‘procurement’ is lagging behind, as a culture change is needed… That’s why we need the American spirit of enterprise! So I am now dreaming of a Smart Citizens or Neighbourhood Cafe where we link to Digital Town Hall meetings as part of the global network of smart cities. Wikipedia has an extensive entry and lists Amsterdam, Barcelona, Dublin, Laguna Croata, Madrid, Manchester, Milton Keynes, New Songdo City, Santa Cruz, Smart Cities in India, Smart Nation Singapore, Stockholm. JORGE SARAIVA was the Portuguese digital enthusiast who joins the dots between Smart Citizens and Smart Cities with the empathy, co-creation, mental and digital connectivity required to make changes happen. on his LinkedIn profile I found the link for the smart city initiative by the European Commission but my experience of such EU websites is that they are a waste of time, as they don’t lead anywhere. FROI LEGASPI was the super star as Community Organiser. He is part of Citizens UK as a an influential and effective movement. He demonstrated user participation by inviting Jorge to sit on a chair, representing my cause which is to stop children being removed from their families to paid foster carers. He then asked me to lift the chair, but using only one hand. and YES, they LIFTED THE CHAIR! Our cause was WON by WORKING TOGETHER!!! RENATO DE CASTRO was the ultimate global star of the Smart City movement. Based in Barcelona, he’s also advisor to Indore and Hyderabad in India and the Greater Boston Area. His video blog is here. I was too excited to keep more notes but trust that videos will be made available for follow-up co-creations. SmartCitiesWorld publishes Barcelona, Bristol, Chicago, Dubai, London, Los Angeles, Manchester, New York, Paris, Singapore, Sydney. The infrastructure for improving smartness requires Buildings, Connectivity, Data, Energy, Governance and Transport. Data sources include UNESCO, the World Bank and Euromonitor. Connected Smart Cities in Sao Paolo next? 21 – 27 June! attending to the needs of the conscious citizen! for cities to become more intelligent and connected! SmartCitizen.me – who make In Car Payments possible for parking! businesses can succeed and local economies prosper. Is this maybe also the Digital Renaissance that I’m talking about when I combine the Humanism of Greece with Art, Science and Technology? One thing is for sure: ‘digital’ is non-stoppable and my feeling is distinctly that the good guys are on the winning side. How wonder-ful that I’m not alone with that feeling! 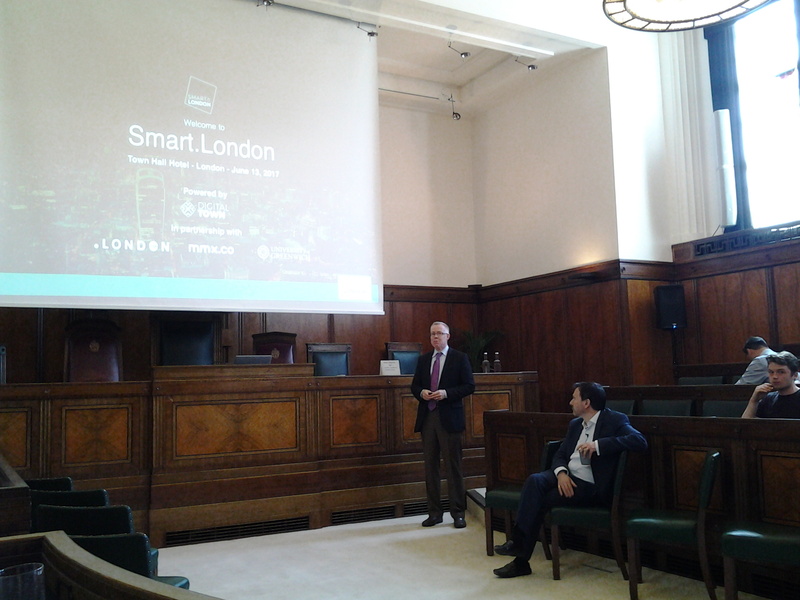 This entry was posted in Big data, Smart Cities, Smart London. Bookmark the permalink.